WITI, the leading Global Association of Women in Technology, launched the worlds first Women in Technology Summit in 1995 and has had more than 100,000 women and men from around the world attend this premiere event to build relationships, collaborate, and update their technical and leadership skills. The Women in Technology Summit series will continue this tradition by empowering women and men in technology through a full day of inspiration, collaboration and interactive training in your city. Be a Sponsor. Support Women in STEM. By taking advantage of this sponsorship opportunity, you can get your teams active and engaged and also demonstrate the company's commitment to supporting women in STEM. This year's series will provide a unique combination of keynotes, panel discussions and interactive workshops on a variety of topics and trends. The summit's networking opportunities will create lasting connection between business and technology professionals. 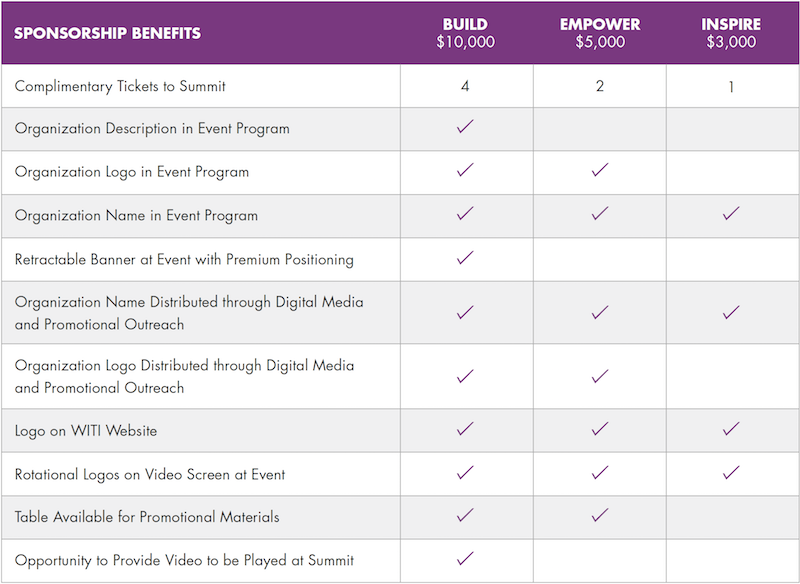 Contact the WITI Team at sponsorship@corp.witi.com or call 818-788-9484.